In Cebu, “tubod” is usually understood as a natural flow of ground water or a spring. It is one of the natural wonders in the Philippines where the Filipinos are proud of. A lot of people, plants and animals have been benefiting from this so called “tubod”. Because of the natural flow of this fresh water spring, swimming pools have been built in the entire country just to delight locals and foreigners of the icy-cool “tubod” which flows freely to the pool with very minimum processing to clean it entirely. One very interesting swimming pool in Cebu is the Tubod Flowing Waters or simply known as Tubod by a lot of locals. It is a resort with a free-flowing swimming pool found in a secluded area in the mountainous area of Minglanilla, Cebu. Other “tubod” pools in the Philippines can be found in Cagayan de Oro, Siquijor, Camiguin and a lot more. One of the most famous areas with these kinds of pools is Iligan, which has Dela Mar Spring Pool, Timoga Spring Pool, El Lauriento Swimming Pool and Mimar’s Springway Resort to name some of them. Tubod Flowing Waters Resort in Cebu has one of the prime swimming pools found in the Philippines and it has been one of the most visited swimming pools by neighboring Asian tourist especially Koreans and Japanese who sometimes lease the entire resort for a month or two. These foreigners study the English Language here so they can absorb the lessons fast because of Tubod’s relaxing ambiance. Tubod Flowing Waters Resort is one of Cebu’s finest. It has been blessed with multiple natural springs that had never been dried down even during the El Niño season. The people in the area have bathed themselves in the coolness of these tubod for generations. Tubod also provide a hearty catered meal, a refreshing plunge and a relaxing room accommodation. They also housed some of the indigenous birds of Prey in the Philippines inside their bird sanctuary. One can experience the best Filipino service and hospitality they provide once you stay there. It’s the perfect place for weddings, seminars, birthday parties and business meetings. Tubod amenities includes 4 large swimming pools for both adults and children, several conference hall which can house up to 300 person, cottages, basketball court, fish for fun, outdoor billiards, restaurant, cave with flowing spring, butterfly sanctuary, pool slides and a grilling area. The entrance fee at Tubod is P100 per adults and P50 per children under 8 years old. A standard single room, good for two is priced at P1,200, while a standard family room, good for four, is P2,000. A deluxe single room with refrigerator and is good for two is P1,600 while a good for 3 is P2,100. A deluxe family room for 4 is P2,600, for 6 is P3,500 and for 8 is P4,000. The fee for an excess person in a room is P350. An air-conditioned dormitory type room which is good for 10 is priced at P3,500 while a non-air-conditioned is P2,500. The Tulip Function Room which can accommodate up to 300 persons is P4,000 while the Aster Function Room with a maximum capacity of 150 is at P2,500. Tubod also provide food catering services for any occasion. They provide flower arrangement services, LCD projector and sound system rental and they provide airport and seaport transfers. At Tubod, customers can bring their own food without corkage fee and the resort provides grilling services. From the airport or seaport, you can take a Taxi or Car-for-hire going directly to Tubod. Just be sure to tell the driver to turn on the meter or negotiate the price first. 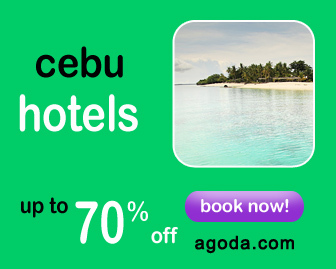 It is about 1 hour and 30 minutes ride from Mactan Airport and 1 hour ride from Cebu seaport. Alternatively, you can also take a jeepney or bus going to Minglanilla or Naga (a town ahead) so you can save on fare. Going south, the corner going to Tubod is found at the right side. The signboard is visible enough for one to notice. Once there, you can ride a “habal-habal” (motorcycle for hire) or a tricycle. Tubod can be contacted at (+63) (32) 272-3467 or 272-8717. You can also email them at aike75@yahoo.com. What are you waiting for? Get that swimming gear out of your storage and invite your families and friends to chill at Tubod Flowing Waters Resort. Tubod is definitely one of the best places to experience the perfect getaway. I am just planning to book of birthday party of my dauther this coming November 12th but I would like to ask if you will be accept for catering?? And good for 50person . yes sir, please visit the property so we can discuss it. My friends and I are planning to have our outing there at your resorts. we will not be staying overnight. We will be bringing our own food. I’d like to ask if do we need to make some reservations? What are the dresscodes for swimming? can possibly tell us what our others expenese be? How much is the cost of your cottages for about 30 persons. I’d like to ask if the place is good for team building. We are actually looking for a resort to held the event. Is it wide enough and does it have a lot of amenities to enjoy to? We will be having a reunion is it okay if we will be celebrating in tubod flowing water overnight?how much is cottage? It is the only resort in Cebu that changes it’s swimming pool water everyday. It’s spring flows 24/7. WARNING: the pool is addictive to children of all ages. hello, may i ask if is it ok not to rent a cottage nalang? hey guys!!!! we are planning to go here in tubod but can anybody answer may questions? 1. how much is the entrance fee? 2. will they charge us if we bring food and drinks? 4. are they selling refreshments? like shake, halo-halo or icecream? i would like to ask if free breakfast/lunch/dinner diha if mu rent tag room? ganahan jud ko makaanha, wa pajud ko kaanha. bisag taga Basak Pardo rako, and kanang 1,200 nga rate sa room. 24 hours ba na siya? Hello . if Female, okay ra kung white tshirt and bathing shorts ang attire ? please respond . Naay pwede e’rent na swimming attire? Pls. reply. Thanks. how much time will be spent only in Php.2,000 and Php.2,600? does it takes 2 days?or 1 sleep only? tag pila ang entrance? ug naay overnight diha? then, tag pila ang cottage? 1,200 ang ila single room good for two.. wala na mas cheapest nga room besyd sa 1,200?? it’s really nice please….we will go there tomorrow…. kuya mark pwede me nimo e-advertise diri…: ) – kuya mark okay nadaw ta for the website…. Is it really a flowing water from spring ? Yes it is! This is the very reason why they name the place as “Tubod”. pila diay ang cottage nin u mga 20+ raman me…..
pila ang cottage good for 2 persons? May I ask if how many people can stay in a 500 peso cottage and in 1500 peso cottage? ask lang ko if php100 pa ba hantud karun ang entrance and if naa bay mga cottage ang tag pila? pwede ba mag kuha ang room for daytime use? mu out ra dayon inig ka gabie? Hi, i’d like to ask if ok lang to bring pet like a dog / puppy? I think it is ok but pets are not allowed to swim in the pool. pila ang cattage nin.u ? hi.. ask lang ta ko kung pila ang ma bayaran sa room for 1 day? from 6pm to 6pm?? pwede ba magdala food?? pwaede ba mi maka sugba2x?? Oh my gush!! This is a perfect place for my friends and BF… awesome!! tanong ko lang po f kailangan pa bang magpa reserve bago pumonta sa tubod? It is not necessary. Just to be sure, reserve ahead of schedule. hi gud am… my family and i are going to cebu on oct. 3 – 6, san ba maganda magstay ng cebu pero cheapest siya.. actually we are planning na mag side trip ng bohol… thanks.. na read ko yung article mo regarding kay kuya dodong sa bohol i try to contact him now… thanks… thanks sa blog mo… because of this nagkakaroon kami ng mga idea..
You can try Hotel Pier Quatro or Sampaguita Suites. My friends and I are planning of having a get together on the last week of August 2011.I would just like to ask if your open for an overnight swimming, maybe from 8pm until 5am?how much will be the entrance and also the cottage?do we need to have a reservation or we can just do walk-in? Thank you!hope for immediate reply. nice place, il be there soon. naa ba rules na pwede suoton if mangaligo dha sa pool?… hope 4 rply. I think only swimming suits (such as bathing trunks, two/one peice), board shorts or anything without zipper or metallic objects are allowed. pwede ba makadal ug food? Yes, you can bring food inside the resort. ahm… pwde ba makapasuk yung sasakyan chaka malaki ba yung da-anan? 20+ kami family trip… hope 4 rply. Yes the road is wide and the vehicles can pass. hi? may i know if open bah ang tubod this coming semana santa? How much is the cheapest rate of your cottages? We are only six persons to occupy. Or puede ba dli n lang mag cottage mo use lang mi swimming pool? is it ok just to stay there for swimming…and will not stay for overnight? how much is the cottages? Yes you can. Overnight stay is not necessary. I think the cottages are priced at P500-P1500 depending on the sizes. If you are only a small group, just try to negotiate for a lower price, they will give you discounts if you ask. how much is the rental fee of cottages for those people who will not have an overnight stay? Thanks! I can’t find the cottage rates at their official website but if I remembered it well, it’s about P300 (4 pax) to P600 (8 pax). just wanna ask how to reach this Tubod flowing waters? i’d be leaving from IT park, Lahug cebu city..
From IT Park take an Ayala Route Jeepney (04L). Then from Ayala take a Labangon Route Jeepney (12L) and stop at Punta Princesa Church (Our Lady of Lourdes Parish). From Punta Princesa Church, you can see a lot of Naga/Minglanilla Route Jeepneys; take one and ask the driver to drop you at the corner of the street going to Tubod Flowing Waters – it can be found on the right side and a big signboard can be seen. Then lastly, take a “habal-habal” (motorcycle for hire) or tricycle going to Tubod Flowing Waters. I am not connected with the resort. Please contact Tubod Flowing Waters directly. Contact information is provided above. Very nice blog and pictures , is this in Cebu? entrance is only P 100 pesos? Yes, this is in Cebu and the entrance of Tubod flowing waters is only P100 for adults and P50 for children. yes nice place, have been there many times. I brought some of my friends from USA and they like it so much; never expected it to be refreshing indeed.